The S&S Complete Chain Drive Cam Chest Kit removes any doubt about the condition of the critical parts in the cam chest of your 1999-’16 Harley-Davidson big twin. 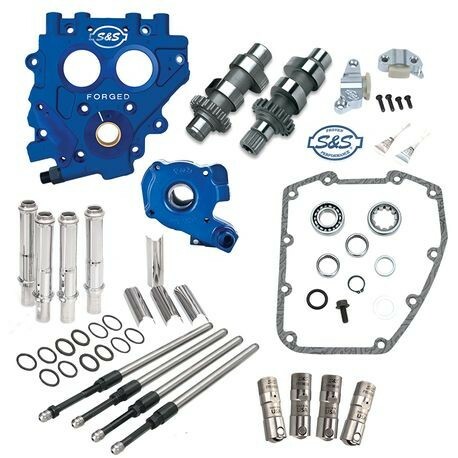 Replace it all – oil pump, cam support plate, cams, and tappets with premium U.S. made S&S cam chest components. Upgrade to an S&S chain drive performance cam set for improved engine performace, higher lift and optimized cam timing. It’s all new and all S&S! Before you even purchase this kit, make certain you have proper crank pinion runout! Bought this kit with .509 lift. All i can say is WOW! Easy install take your time. Instructions are well done. I had accsess to an arbour press if not, spend a couple of bucks have someone press the bearings and, cams in. Inner bearing tools will also be a great help. Tools are everything, spend a little extra too make things happen easily. Straight forward easy as pie! LOTS of pull 2 up on a poor boy DYNA Bagger. Nice S&S kit!